KT Group has for several years focussed on providing a service for clients interested in developing a terminal that is designed to suit the concept, a reference case of ours that successful launch 18 months ago in conjunction with an established Middle Eastern pharmaceutical distributor KT pitched its design services, engineering ability combined with resources that allow us to manufacture high volume orders via our metal production plant to jointly with the clients vision to prepare a medical kiosk that although simple in functionality can provide basic elements to a medical kiosk. 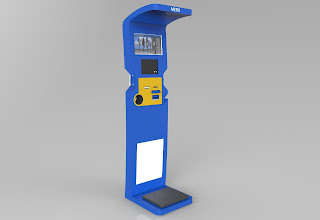 The model now referenced as i5 primary services are to provide precise weight readings in kilos, measure the height of the individual, and if user decides they also want to receive blood pressure and fat content accurate readings the premium upgrade allows for this as well. The unit was built to be used within a pharmacy or hospital environment, many users may not be educated in interacting with a touchscreen based operation due to lack of knowledge, experience or age so the terminal is operated by a simple button operation that provides simple easy to use steps for each service machine can deliver and the locations are able to use the additional informational digital monitor to run messages including multimedia and audio files on the screen that can inform passers-by of services the terminal offers at a quick glance a final request from our customer was to provide a traditional print post area that KT designed into main cabinet and we added LED lighting to brighten up poster frame. The solution is now already expanded with first 270 terminals installed in specific client locations in Middle East, and customers’ expectations for forthcoming 12 months is to increase the number by doubling its numbers due to popularity in use that as customer explains is due to KT experience in providing a design that encompasses all requirements in a design that can entice the user to terminal to trial it.